Written by Adam Reece - 24th January 2008. This guide will teach you how to install DOSBox, Descent 1 or 2, and successfully play a multi-player game with IPX over UDP. I will be mainly focusing on Descent 2 as it's much better. If you're after the map pack, click here (last updated Monday, 28th January 2008 at 5:12 PM). If you are unable to read text for more than 5 minutes, go away. This guide will not be for you -- impatient sod. This guide also assumes you have a fair level of knowledge on using a computer. 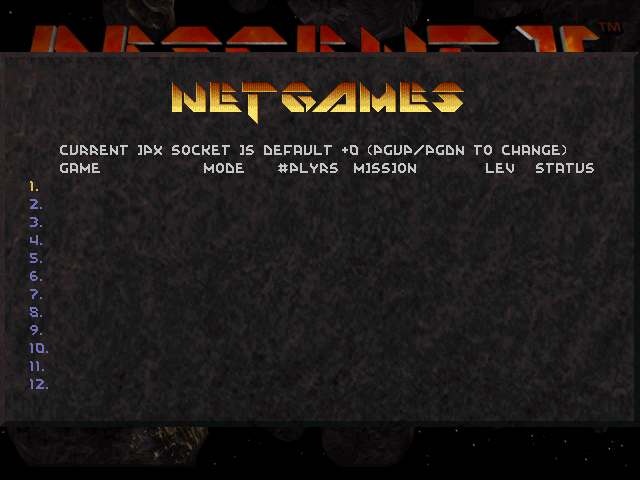 To play we are going to use the MS-DOS versions in a program called DOSBox. Yes I know there is that D2X-XL port that does UDP/IP multi-player, but it has some performance issues at the moment -- and a few minor glitches. You (or probably just me) will be glad to know that this will work entirely on x64 editions of Windows. DOSBox is a free x86 emulator that runs in a variety of operating systems, although I am teaching you how to use it in Windows. You can use Linux or Mac OS if you like. First of all download the latest version of DOSBox from here and install it as normal. Download these configuration files and extract them to your DOSBox folder. Say yes to overwriting. You will find 3 folders have been made. One called HDD, another called CD, and another called INSTALL. The HDD folder will contain the DOSBox hard disk contents, the CD folder will contain images of CD's you want to mount later on, and the INSTALL folder is for your own use to mount (temporary) application/game install files to. If you intend to play Descent 2 the game requires the CD in place to run. You have a number of options to get it working. Both games will require a CD when you install them for the first time. If you know how to create an image of a CD and mount it, go ahead and do that. Remember to use an image format that can hold multiple tracks (for CD music). ISO images can't do that, but BIN/CUE is perfect. If you intend on using a physical CD directly then simply put it in your computer as normal. A reminder that we will not be using the Windows 95 version of Descent 2, so close the autorun program. Important: You will also need to create an image for the Vertigo expansion if you intend on playing that (which you should). If you intend on having the high quality CD music you must create your image using the BIN/CUE format. ISO images cannot store multiple tracks. 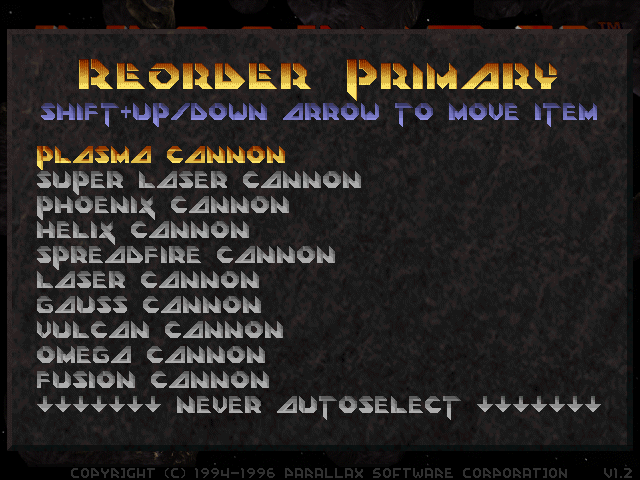 Also DaemonTools and similar tools will be useless, as compatibility will be lost and CD music won't work in DOSBox. Once you have your physical CD or image ready start up DOSBox. It should look like this. If it doesn't, you need to go back to step 1. Always remember that you can use ALT+ENTER in DOSBox to switch between windowed and full screen mode. Using the Windows key will more often than not cause DOSBox to crash. For using physical CD type CDROM x. Replace x with the matching drive letter you'll find in My Computer -- most commonly D.
For using a CD image in the DOSBox CD folder type CDIMG file letter. If for some reason you're told that you've entered an illegal command, you have not extracted my DOSBox configuration properly. Otherwise you're ready to install Descent. If the CD has mounted correctly navigate to the CD by typing x: - replace x for the chosen drive letter. Then type install. The installation process will start. Keep following the install process. Install it to C:\Games\Descent for Descent 1, or C:\Games\Descent2 for Descent 2 (and Vertigo). Select Crazy for space consumption during the Descent 2 installation. Say NO to installing the S3 virge version of Descent 2. I've not really tested this in DOSBox, although it CAN handle S3. 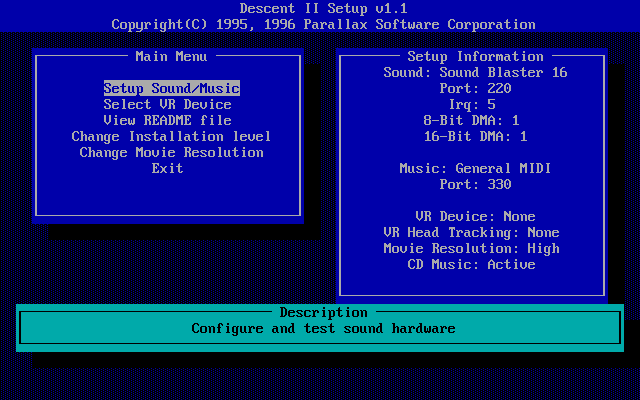 Once the game is installed, you will be taken to the setup program where you select sound configurations. Once that's done, save and close the setup program. 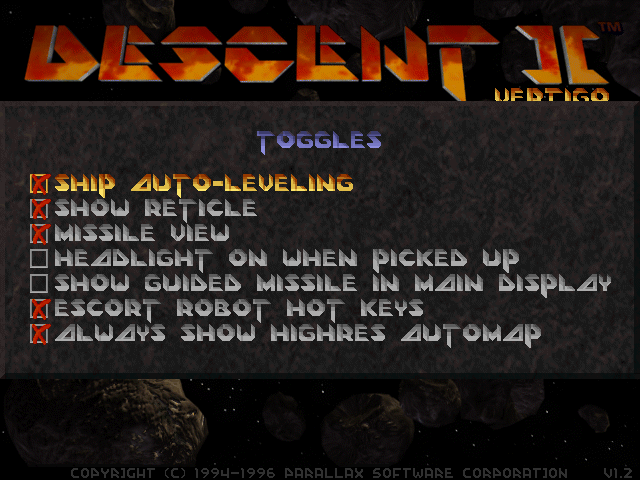 Please ensure you install Descent 2 Vertigo for a larger range of multi-player modes and maps. Now let's get some custom maps installed for more choice. Navigate to your DOSBox folder, then HDD, then Games, then Descent2, then MISSIONS. Download this map pack (last updated Monday, 28th January 2008 at 5:12 PM) and extract it in the MISSIONS folder. After that, you're ready to run the game. C:, then CD\Games\Descent, then DescentR for Descent 1. C:, then CD\Games\Descent2, then Descent2 for Descent 2 / Vertigo. I will be focusing on Descent 2 / Vertigo from now on. Adapt what I'm saying for Descent 1 if you want to play that. In Descent 2 / Vertigo you will be shown the intro movie. It's quite good (for 1996), but if you don't want to watch it hit ESC. You should watch it if you intend to play the single player mission. 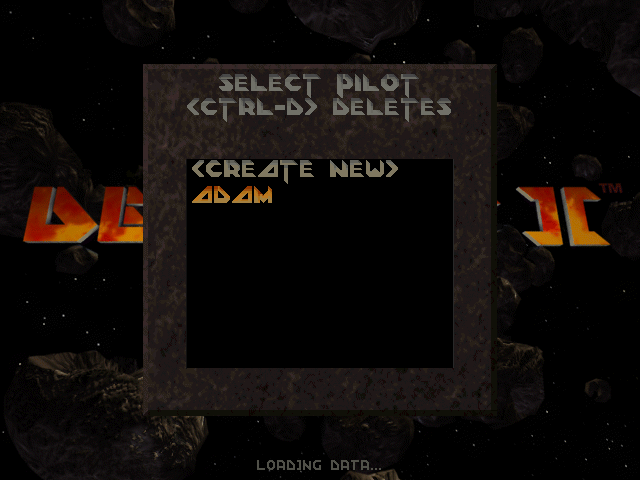 The first time you run the game you will be asked to create a pilot. 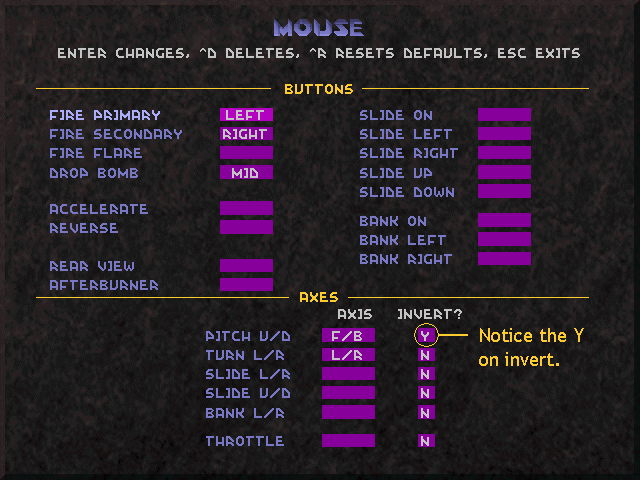 Do that, then select mouse for controls. If it's not the first time simply select your pilot from the list. Now we need to set the game options. You only need to do this once until you re-install the game. 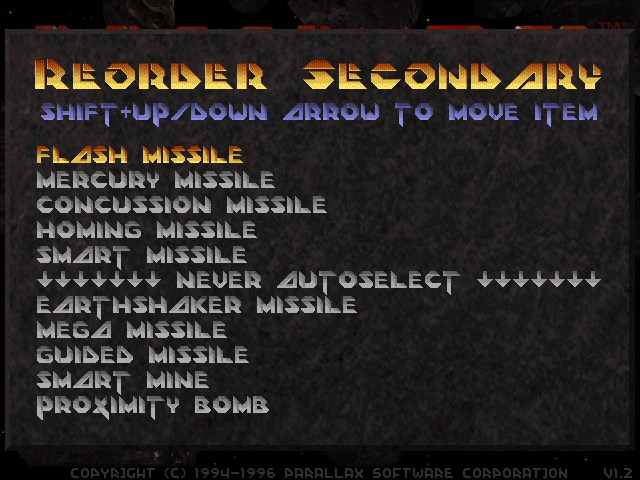 Some of these options will not be available in Descent 1. 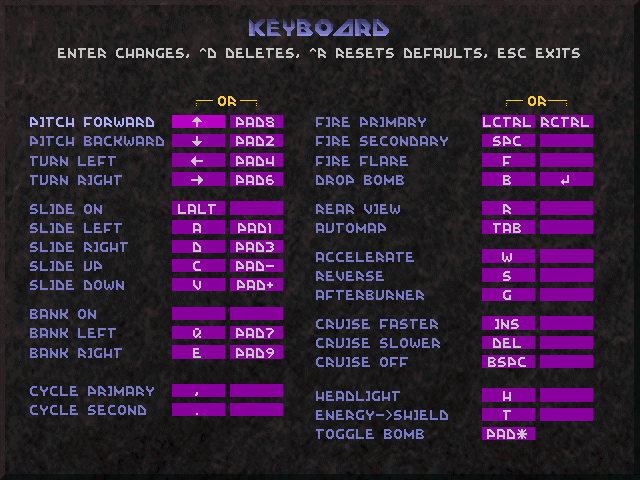 From the main menu select Options, then Controls, then Customize keyboard. I have my controls set like an FPS game. I recommend you copy and tweak my controls as shown below. Press ESC when you're done with that, then select Customize mouse. Again, copy my settings here to give an FPS feel. Press ESC when you're done with that, put the Sensitivity to max (trust me), then press ESC to go back to the options. Now select Screen resolution. 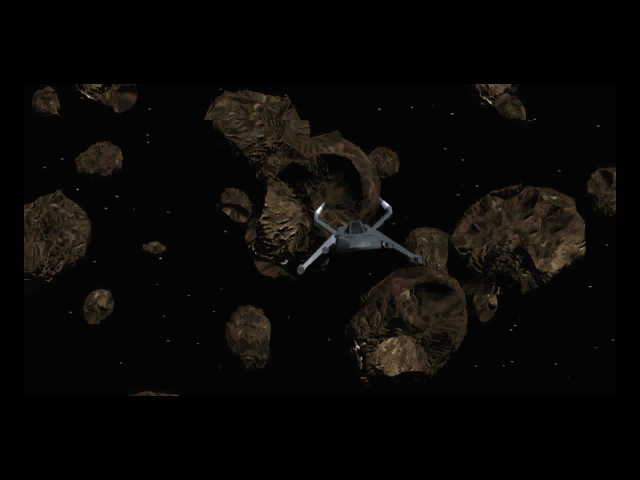 Select 640x480 within w/ cockpit (use spacebar to select it). If you don't like the cockpit in game, you can always press F3 to turn it off. I find that 800x600 or higher runs slow in DOSBox. Press ESC, now select Primary autoselect ordering and copy my screenshot here. You are free to adjust these if you like some weapons more than others. Press ESC, now select Secondary autoselect ordering and copy the below. Again, you are free to adjust these if you like some weapons more than others. Press ESC, now select Toggles and copy the below. Feel free to change these if you like, but using full screen guided missiles and headlight on when picked up isn't useful in multi-player games. Now press ESC to go back to the main menu. Your game is setup. You can always access all these options during a game by pressing F2. I recommend you play just some single player first to test out and get used to the controls. The first 4 levels should be fine. First, exit the game if you're in it. We need to start up IPX networking over UDP/IP. Type ipxnet startserver port, then CD\Games\Descent2, then Descent2. Ensure the port you choose is reachable, especially across your NAT router if you have one. You may require forwarding it. Select your pilot, then Multiplayer, then Start an IPX network game. Select the mission pack you intend to play. 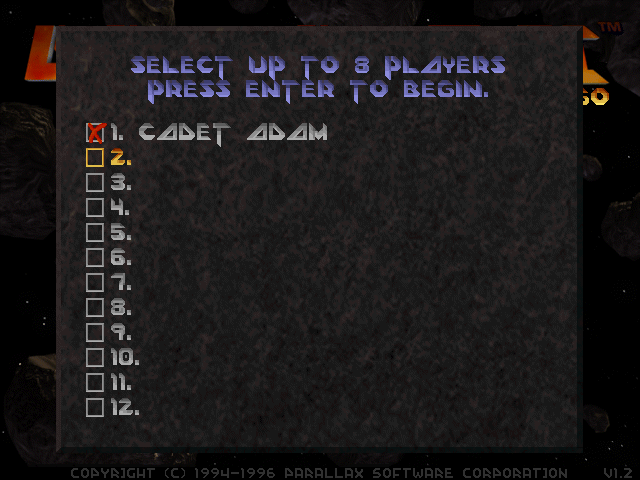 You select an individual level number later. Now you configure your multi-player game. It's all straight forward, but here are descriptions of the game types. 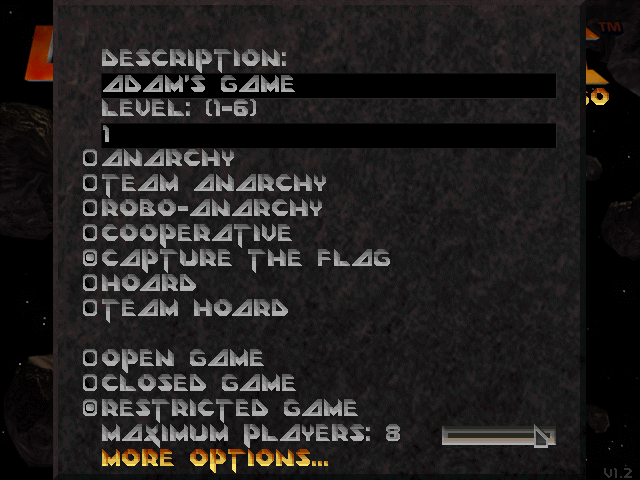 Anarchy: Deathmatch, free for all. Team anarchy: Deathmatch, teams (blue vs red). Robo anarchy: Deathmatch, free for all but with robots in your way too. Co-operative: Play a mission in co-operation. Capture the flag: Team CTF (blue vs red), flag spawns at random places once captured. Hoard: Collect as many things (blue balls or something?) as you can. Requires Vertigo expansion. Team hoard: Same as hoard but with teams (blue vs red). Requires Vertigo expansion. The 3 game modes are as follows. Some game types are limited to specific modes. Open game: Anyone can join and leave the game as they please. Closed game: Only players originally accepted by the host can join and leave as they please. Anyone else will not be allowed in. Restricted game: (recommended) Anyone can join and leave the game as they please, providing the host accepts their connection attempt by typing a displayed keystroke. This does not apply to players originally accepted by the host. Select more options to set some other configuration stuff. I recommend you enable indestructable lights and show enemy names on hud. 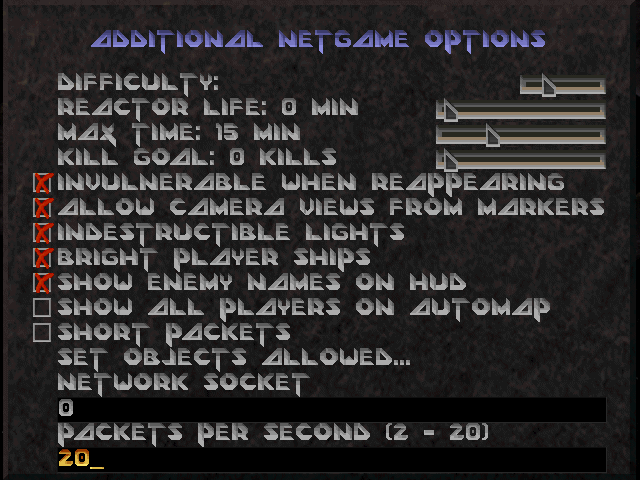 Tick short packets if you have any player using a dial-up connection. Keep network socket as 0. The rest is up to you, but be careful as some settings will dramatically alter gameplay. Once your game is setup, press enter. Instruct all other players to join, select the players, then teams (if it applies), then you're away! Enjoy the game. 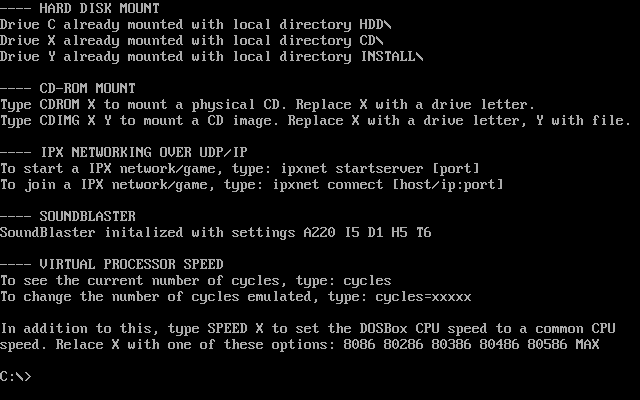 Type ipxnet connect [host/ip:port], then CD\Games\Descent2, then Descent2. Select your pilot, then Multiplayer, then Join an IPX network game. Ask the host which channel is being used, then use page up/down to select it. Once the game appears, select it then you're away! Enjoy the game. Remember that DOSBox is an x86 emulator. You determine how fast the virtual processor works with the cycles option. You should leave it on max unless you have problems. My processor is an AMD Athlon 64 x2 4800+ (2.4 GHz), and I get great performance in Descent 2 by setting 120,000 to 160,000 cycles. However, it maxes out one of my processors. If your CPU is greatly older (or only has 1 core), you may find the game lagging a lot at 160,000 cycles. Try 80,000 cycles to begin with, then increase by 10,000 each time until you find the smoothest speed. Stepping refers to the cycle steps made with CTRL+F11 and CTRL+F12 keys. Page last updated Sunday, 14th October 2012 at 10:15 PM, executed in 0.077 seconds using 9 queries. It has been viewed 408,999 time(s). Design and content © copyright Adam Reece 2003-2019. All rights reserved. Please send any problems you encounter on this website to the manager Adam Reece, thank you.